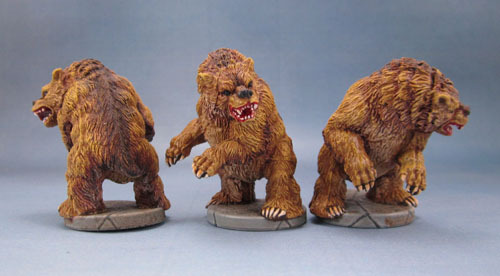 D&D Monster Manual 7: Wrath of Ashardalon Giant Snakes and Cave Bears | Azazel's Bitz Box. No updates for a little while. New role at work with increased hours has meant less time for painting, blogging, sleeping, gaming and all of the other stuff that I enjoy. Not to mention the weather has been unsuitable for spraying lately as we slide towards winter here. I’ve added a new category today. Dungeons and Dragons monsters down on the sidebar, and gone back to rename the D&D-centric posts with the “D&D Monster Manual” prefix, as I’ve done above. I did this because when I was outside a little while ago photographing this update’s models, it occurred to me that I do have quite a few D&D-type monster models, from boxed games like Ashardalon and Ravenloft as well as from Reaper’s Bones campaigns. Since I’ve got categories for all the Warhammer-centric subfactions under the sun (with many more to come) I thought it made sense to do the same for the D&D stuff, even though it’s never been a core game for me and I don’t know what a lot of the stuff in it is properly. I’ve only done this for the most obvious things, specifically the “proper” D&D models, and Not-D&D models by Reaper. More generic stuff like Elves and Goblins and Skeletons from a dozen different manufacturers in a dozen different styles can just go into their own categories and people interested in those can look in there, but as I get more of the “proper” D&D models done, I thought it worthwhile for these. So, first up (in post 7 of the series – gotta love retcon edits!) 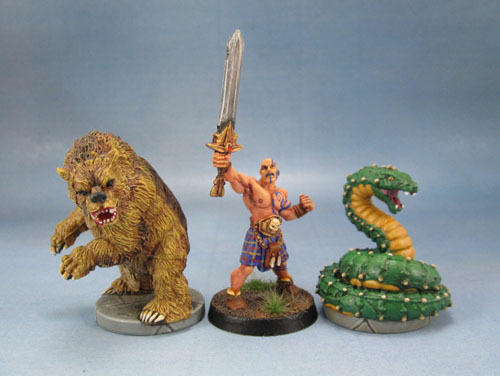 we have the Giant Snakes and Cave Bears from Ashardalon. Neither are super-amazing figures, but they’re still quite nice sculpts, especially in PVC, and as Boardgame Miniatures they are really very good. I understand that they are (or were?) also available as pre-paints from the D&D miniatures game. Again something I’m mostly ignorant about. First up, we have “Snake” from Wrath of Ashardalon boxed game. I’m assuming that these “properly” come in several different flavours, but I’m happy to just go with “Giant Snake”. These three have been near-painted for.. well, quite some time. At least a year, and probably around 2-3, when I was really into painting the boxed D&D games’ figures. Finally knuckled down and got them finished yesterday after doing a little on them last weekend. They’re a little bright, and much more on the “fantasy artwork” side than the “realistic” side in their colouration, but that’s ok by me. The important thing is that they look good on a table, and more importantly – are finished. Next up we have “Cave Bear”. These were actually painted a year (or two?) ago. Aside from the unfortunate PVC mould lines, these are lovely little sculpts and painted up like a dream. I’ve always been pretty happy with how well they came out, as well. Obviously here I went for more of a realistic feel to the colours, though still keeping it bright. Dungeons and Dragons Ashardalon figures with Scale reference. 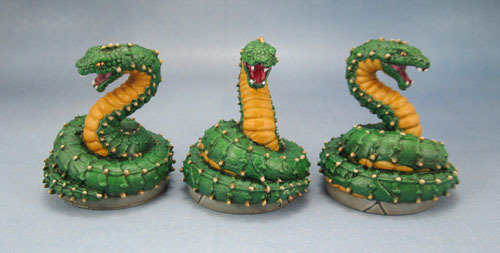 This entry was posted in Dungeons & Dragons Monsters, Fantasy Gaming, Miniatures & Gaming and tagged Cave Bear, D&D, Dungeons and Dragons Miniatures, Giant Snake, Wrath of Ashardalon. Bookmark the permalink. The painting on those bears is absolutely great. They look like exceptional figures. I have at least one of those coiled snakes around the place, I must give it another look.